In October of 2002, I first visited New Harmony, IN. My sense of the place back then was fuzzy. I had a bit of a bead on its meaning: I knew that it had been founded as a religious community in the 19th century, but mostly what I knew was that one of my heroes, the great theologian Paul Tillich, held the small town in high esteem. So that day I was burning east on I-64, enroute to Richmond, KY, where I'd been invited me to speak to students at Eastern Kentucky University. I decided to call up my buddy Guy Sayles, who at that time was the Senior Pastor at First Baptist Church of Asheville, NC. He actually answered! Guy suggested that I visit New Harmony along the way, then added, "You know, I heard somewhere once something about Tillich's heart being buried there." Well, it was all over. I was already looking for the next exit to New Harmony. My love affair with Paul Tillich began in Jonesboro, AR, as a sophomore Philosophy student at Arkansas State University. I was caught up in a renewed relationship with God, due largely to the loving community at the Baptist Student Union, and the very patient and nurturing ministry of our two campus ministers, Benny Clark and Glenda Fontenot. I was also being mentored at the time by two deeply faithful Professors, Scott Darwin and Chuck Carr. This was the first Christian community I'd ever been a part of that actually encouraged me to think, and to think hard, to trust the authentic questions as gifts from God. We read theologians like Emil Brunner, Soren Kierkegaard and Paul Tillich, as well as other exciting writers that stressed the relational adventure of faith: Robert Raines, Keith Miller, Bruce Larson. We took poet Rainer Maria Rilke's words to heart: "Live the questions now. Perhaps you will then gradually, without noticing it, live along some distant day into the answer" (Letters to a Young Poet 35). When I first arrived at Princeton Theological Seminary in the fall of '79, I saw that Dr. George Stroup was teaching a class on the theology of Paul Tillich. 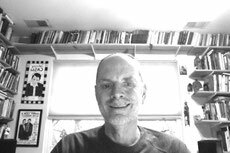 Though I'd no real sense of what all this entailed, and was armed only with a surplus of passion and only a cursory understanding of two of Tillich's thinnest books, The Dynamics of Faith & My Search for Absolutes, I knew with something akin to evangelistic fervor that I had to be in this class. This meant a trip to my advisor's office, which is how I first came to meet Dr. Daniel Migliori. He did the best he could. Really he did. But even though he knew better--I'd not yet taken any classes yet, much less the requisite Introduction to Theology--he relented. I was in! And in heaven--until class began. Then I was lost--in deep and sinking fast, struggling to dog-paddle while all the others calmly whistled as they backstroked past me. Seriously, they knew how to spell ontology. They casually used words like Weltanschauung as smoothly as I quoted Lynyrd Skyynrd. So I did what I always do when I'm in way over my head, I used my head. No, I moved into my head. My faith became largely a cognitive pursuit. I cannot tell you how terrifying and refreshing this was for me. For a while. Years, really. Until the walls of that room began to close in. Although I've never lost my love for the mind, for what Alfred North Whitehead called the "adventures of ideas," I ever so gradually came to see faith as even more, as a surrender to the larger life of God's Presence that envelopes and fills and holds all things. This is a living Presence that speaks a relational rhetoric, which may include any idea that's truly worthy of consideration and consent. Of course, many ideas aren't. I wouldn't give you two cents for a mindless faith, any more than I would for a faithless mind. That's where Jesus' advice to be "wise as serpents and gentle as doves" comes into play. But back to New Harmony. I exited, in hot pursuit of Tillich's heart. I stopped repeatedly, but instead of asking for directions, I asked for Tillich's heart. Could they tell me where it was buried? Well, not quite, but they'd be glad to direct me to the state hospital. Finally, a raspy-voiced woman behind the Quick Shop counter said she'd heard there was a park named after some guy. It occurred to her that I might find that heart there. So I went where she pointed and found, behind the Red Geranium Restaurant, tiny Paul Tillich Park, sitting in a little grove of spruces. I walked along the winding mulch trail, stopping at each granite stone inscribed with lofty quotes from his writings. 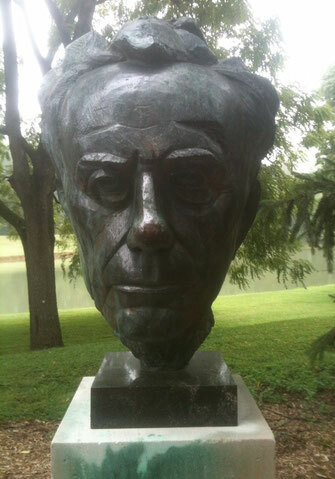 Then I came to this massive bust of Tillich overlooking a large pond. Here were buried Tillich's ashes. The place was serene and silent. He was all head. His neck seemed so tight, so small, as if one stiff breeze might sever him from earth altogether. The sculptor, James Rosati, had created a startling image of exactly how Tillich had impressed me. All that time I'd spent reading Tillich had left me high and dry, perched anxiously in my head instead of nested in my heart. But where was Tillich's heart? Tillich's heart is not buried in New Harmony, only his ashes, but New Harmony lived in Tillich's heart. (Just think of Tony Bennett and San Francisco.) On the Day of Pentecost, June 2, 1963, Tillich stood near this exact spot and said: "I, Paul Tillich, give my name to this place, and dedicate the ground of this park...to a new reality, conquering what is estranged and reuniting what belongs to each other, in the power of the Spiritual Presence." In his heart, he loved the relational power of Christ's New Being, however partial and tragically expressed its manifestation in history. My good friend Guy Sayles sent me on a wild goose chase for Tillich's heart. Instead, I found his head--and a great reminder of where I'm so apt to bury my heart. And I was sent back to what matters most to me. Its not the big ideas, great books, or speaking in footnotes--it's folks like my buddy Guy Sayles, or friends like Benny Clark, Glenda Fontenot, Scott Darwin, and Chuck Carr, who live out their stout faith with both head and heart, allowing each to engage the other as they throw themselves headlong into following Christ. In fact, I don't know of anyone who does that as well as Guy does. He may not know diddly about where Tillich's heart is buried, but I keep on listening to him, because he scouts things out, and you never know what waits at that next exit--only that you can trust it to warrant all you are--body, mind and soul. Terry, You get better and better with these posts. Thanks so much. Belden, than you so much! Writing these has become a good discipline. I'm enjoying it. Thanks so much for reading them! Sometimes it can be a little scary to take that exit. What if it isn't the right one and it leads you in the wrong direction! I hear you, Carolyn. There's always that risk, isn't there? Terry, this post is delightful and smiles with truth. I know I've looked for heart often and found "head" instead. You are so right that it is the integration of them which we seek. Glad I "misled" you that day! Guy, glad to have you as my Spiritual (Mis)director! It's cool that several people have "quibbled" with me, saying that I actually did find Tillich's "heart"--it was just in the form of ashes. I like leaving the story as is, however, letting its indirection do the work. But the fact is, I'd follow your wise counsel any where! I so agree with Belden. Your posts are so thoughtful and well-written. Andrea, thank you so much!